It is said that if it rains on your wedding day, it’s good luck. But nobody told us that good luck also was to be had when a wayward seagull torpedoes its dung from high all of you on your honeymoon. Or at least that’s what everyone in Galway, Ireland told us on our final evening of a memorable trip capping our first three weeks as a married couple. We were to learn the hard way that apparently both are true. After leaving our home state of Colorado, my wife-to-be and I married on an unsettled day in a picturesque New England village in Vermont, and then jetted off on a memorable honeymoon during unseasonably warm and sunny weather to Ireland and the Scottish Highlands. It shouldn’t have ended up that way. Originally, our honeymoon plan was to go to Australia, a somewhat frequent business-travel destination for me. But when we added up costs, the length of travel returning from Vermont to Colorado, unpacking and repacking and then onward to the land down under, plus losing a day crossing the international date line, we decided that, while we still wanted to go abroad for the honeymoon, it had to be a more accessible destination. It didn’t take long to find that special place overseas. “Ireland,” we both said almost in unison. Debbie and I had vacationed there several years earlier, loved the country, but it was such a whirlwind trip we never felt like we got to experience any one part of the country enough to fully appreciate it. So we decided to return to County Kerry and base ourselves in the lovely hamlet of Kenmare, a convenient base to both the rings of Kerry and Beara, and in the shadow of Kilarney National Park. Late in our trip, we would venture on to the stunning Highlands region of northern Scotland. Always a dream destination since I couldn’t remember when, the Scottish Highlands have to be one of the most beautiful—and undiscovered—gems of our planet. Craggy, windswept mountain peaks, endless rocky coastline, fertile green valleys galore and small settlements with quaint bed and breakfast inns beckon, just a short flight from Ireland or via train from England. Think Colorado’s Rocky Mountains, the Oregon coast and the south island of New Zealand all rolled into one, and you’ve got the Highlands. Always true “do-it-yourselfers” on our vacations, our honeymoon was no exception. Tours aren’t our thing. The freedom of exploration and to set our own schedule and get off the beaten path is our travel style. Flights booked on Aer Lingus from New York’s JFK airport to Shannon, Ireland (Aer Lingus time and again has proven to us to be the cheapest way to get from the United States to Europe). Check. Rental car at airport. Check. Flights on tiny Irish carrier Aer Arann to Scotland. Check. Quaint inns owned by locals and frequented by international travelers. Sort of – we prebooked only a few nights, preferring the joy of discovery as we pulled into off-the-beaten path hamlets. In almost three weeks, we experienced memorable scenery, wonderful food, friendly warm people, unusually hot and sunny weather, true relaxation and celebrating our new bond as husband and wife. Of all of our accommodation, our favorite was the Whispering Pines, a homey bed and breakfast in Kenmare, Ireland run by John and Mary, a lovely Irish couple who you wished you were related to. Comfortable and modest without being pretentious, it was hard to leave upon our first trip to Ireland, so we booked several nights. 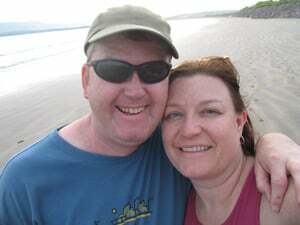 Day tripping was easy here: a romantic seaside dinner in Waterford after a picturesque drive in the Ring of Kerry. A loop of the Ring of Beara – just as stunning as Kerry, but much less visited. 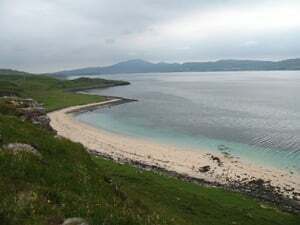 Another scenic drive and a picnic lunch on a deserted cliff high above the bay on Sheepshead Peninsula. And all the hiking we could handle in Kilarney National Park. That’s not to mention the delectable selection of local eats (fresh seafood here is not to be missed) and traditional Irish music in the quaint center of Kenmare, an easy walk from Whispering Pines. The weekly Wednesday market brought vendors from all over Ireland and the rest of Europe selling the freshest produce, bread, meats and cheeses, and vendors selling everything from handmade jewelry to University of Oklahoma baseball hats. 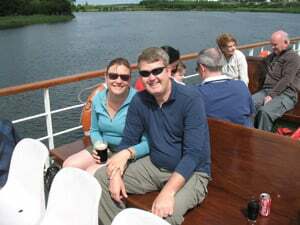 From Kenmare, we traveled north to the Dingle Peninsula for several days. Bigger and a bit more touristy – but by no means overcrowded – we again indulged our culinary senses with rich, exquisite Irish cuisine and local seafood, long drives to the end of peninsula, hikes on golden sandy beaches and windswept moors, and handcrafted lattes. The Tower View bed and breakfast was our based, a brightly colored multi-room house with a small petting zoo out back – the miniature ponies were a hoot. One of our most memorable experiences was a guided sunset sea kayaking adventure in Dingle Harbour. Paddling five miles out and back while the setting sun painted the sky hues of pink and orange was a treat. But seeing the local resident dolphin, named Fungie, up close as he came to play around our small group of five was special. We could have paid a lot more money for a jammed-pack tour boat to see Fungie, but we’ll take a private audience with the local celebrity every time. We paddled back to shore after our brief encounter, walked into town and had our nightly fill of Guinness before calling it a night. Our next journey was to Highlands. The warm weather we had in Ireland gave way to downright hot weather as we left Ireland on our short flight to Inverness, the largest city in north Scotland. It wasn’t long until we were following Loch Ness – glistening in the late afternoon sun but nary a Nessie sighting to be had – south to the mountain hamlet of Glencoe, and the lovely Callart View bed and breakfast inn. From our top floor bedroom we looked onto a picturesque lake, ringed by deep green mountains on all sides. Avid outdoors people, we thought we were in hiking heaven – too many beautiful trails to choose from. We picked a stunning, but very steep, mountain pass on a rare humid day. Our effort was rewarded by a rushing stream, fantastic views, and the perfect rock for a picnic lunch. Of course, a visit to the local pub for a Guinness and a late lunch washed our sore muscles away. 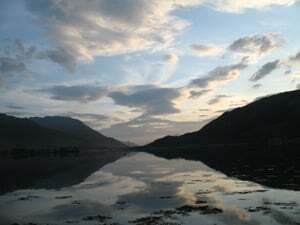 From Glencoe, it was an endless parade of one rolling mountain range, scenic glass-surfaced lake, fertile green valley and quaint little village after another, as we headed west to the Isle of Sky. Humid and hot weather slowed us down a bit, but as we headed to the bustling market town of Portree, and then back onto the mainland to the fishing village of Ullapool, our appreciation for the special place only deepened. We then headed back to Ireland for a last couple of nights in the lively west coast city of Galway, complete with buskers and a lively traditional Irish music scene. And it was there we learned of our extra dose of good luck. It was our last night of the honeymoon. After a relaxing massage and hot shower, we walked into town for our farewell dinner. As we meandered down one of the city’s narrow streets in search of memorable dining experience, we instead got a memorable experience of another kind. All of a sudden I felt a “splat” on my clean clothes, my shoes, even my head. I thought it might be extra-large raindrops. But reality hit when my wife told me I was doused with bird droppings. Apparently a rogue seagull high on a steep a-frame rooftop. It hit me even further when a local man on a bicycle stopped and started laughed hysterically at my plight. “Don’t worry – it’s supposed to be good luck,” he said in between cackling at me. I was hardly laughing; I was cursing at that point; ready to leave Galway on the spot. I stormed back to our B & B, the Prague House. Unfortunately there was no laundry open at that hour, so I sheepishly asked the owner, Mary, if she wouldn’t mind washing my clothes for me. “Don’t worry,” she said, “that’s considered good luck.” I still wasn’t amused. But all turned out well – I showered, we walked back into town – eyes gazed skyward, somewhat in paranoia, at least by me – and dined at an intimate little restaurant, recovered from the experience and enjoyed the night. The following morning, an American couple also on their honeymoon sat next us. We told them what had happened. “It’s good luck, you know” they told us. Soon we were on our way to the airport and back home to Colorado. We figured that with so much good luck courtesy of the now-famous “Good Luck Gull from Galway,” nothing could wrong. And it didn’t. The trip home crossing the Atlantic was smooth, and we were able to laugh it off, leaving with incredible memories and a thirst to return again to both countries one day soon.